I've already mentioned that the N8's USB-On-The-Go is awesome, but thanks once again to Ahmed360, we now have a picture of the feature in action. 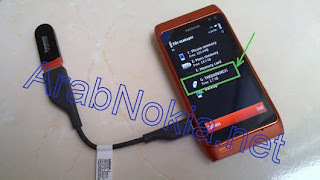 As you can see, the N8 is connected to a 2GB Transcend flash drive which is displayed as the G drive in the file browser. Does the adapter come with it? Yes, I believe the adapter will come in the box. i have tried to connect many flash drives with my nokia n8, but it says 'memory device corrupt'.